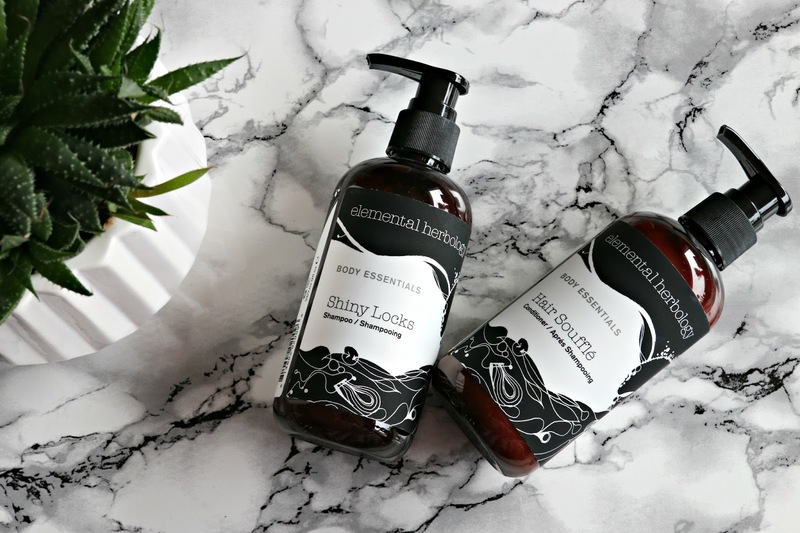 Elemental Herbology have launched a brand new hair cleansing and conditioning duo, rich in natural ingredients, that’ll have your locks super soft and shiny after the first wash! Love the sound of that? Then read on! Elemental Herbology products are longstanding members of my bathroom stash. 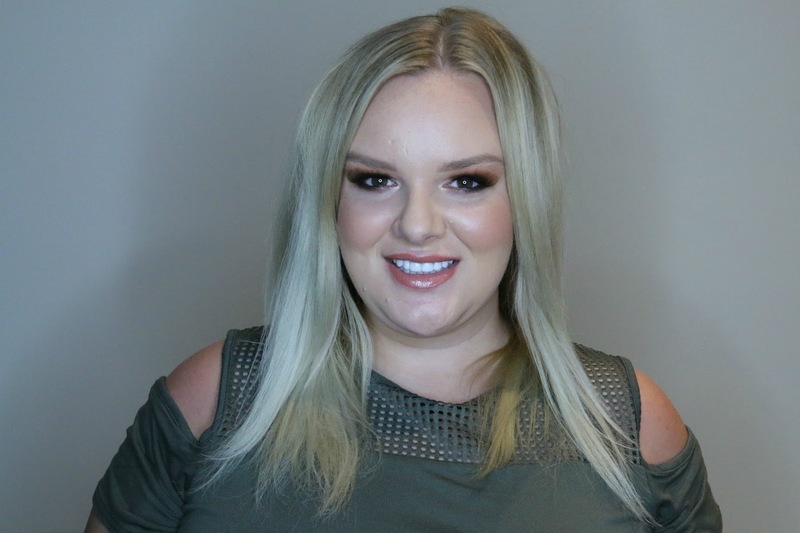 I first used their products when I was preparing for a huge life event many years ago; I fell in love with some skincare essentials that are perfect for oily skin and I’ve used their products ever since. This new shampoo and conditioner are the first venture into haircare for the brand and I couldn’t wait to see if they lived up to the expectations that the skincare had set… SPOILER ALERT, they do! I must first give a nod to the packaging; pump action bottles are so much easier to use in the shower and I love that they have a slight apothecary look to them. They’re in that signature yet simplistic Elemental Herbology style that looks so stylish in any bathroom. 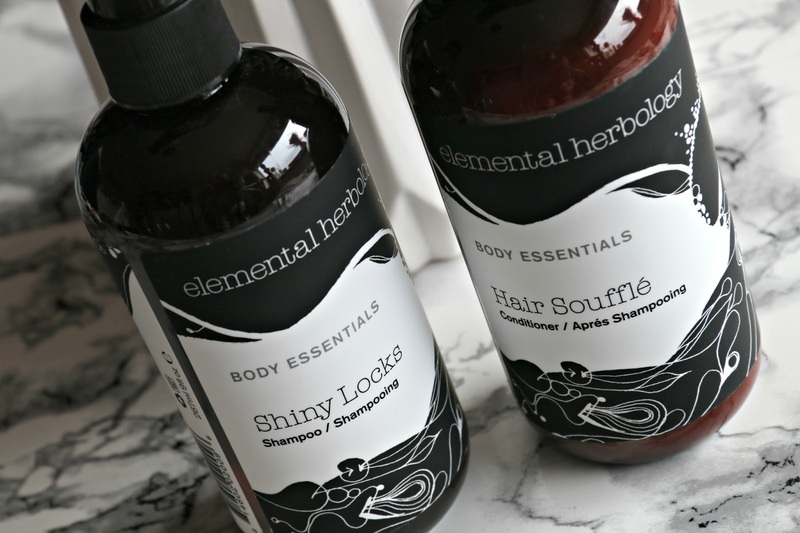 The Elemental Herbology Shiny Locks Shampoo is a cleansing yet softening shampoo that does a great job of cleaning the hair and scalp without leaving it feeling dry. The gentle surfactant within Shiny Locks ensures that it cleanses without irritation as it lathers gently and, together lavender and honey within the formula, it soothes the hair and locks in moisture. Wheat proteins help to thicken, add volume throughout the hair and shine to the hair too which is definitely what my fine hair needs. I love the way that my hair feels clean and soft after use with a healthy sheen to it but without a greasy or weighed down feel. I usually avoid shampoos that claim to make the hair shiny because it usually means that they wont be suitable for my greasy roots but this one works perfectly well. Just like the shampoo, the Elemental Herbology Hair Soufflé Conditioner softens my hair without weighing it down. It contains jojoba oil and shea butter to hydrate, nourish and leave a glossy finish and the rosemary in the formula is intended to stimulate circulation, with the scent invigorating the mind. I squeeze out the excess water from my hair, apply it to the mid-lengths and ends and leave it on for a few minutes while I wash my body and exfoliate, before rinsing it out. My hair instantly feels so smooth and its easy to brush through, as though the conditioner has had a detangling effect. Once blowdried, my hair is soft, visibly nourished and glossy. Whats great about it is that the soft feel and appearance lasts until my next wash. If you’re looking for a new shampoo and conditioner to clean and care for your hair, then give them a try. You can buy them direct from the Elemental Herbology website. What are your favourite Elemental Herbology products? What haircare do you like to use on your own locks? Previous Post Plus Size Bardot Swimsuit You NEED This Summer! Hi, I just want to say this is a great post. I used to have the same problem with my hair getting greasy rather quickly. I switched to a new brand of shampoo and conditioner a while ago and it works great. However, if I ever want to try something new, I'll definitely think about giving this a try. Thanks for opening my eyes to a new product. Nice post! However I'm surprised to know that elememtal herbology hair conditioner works like my shampoo!! I had to use it as soon as my shampoo gets over. I've used many shampoo but I regret for every shampoo. May be this will work for my hairs!! Ooh I love the sound of this! Your hair is gorgeous! I am a creature of habit and tend to use the same shampoo and conditioner always, I really need to try something new! Really useful thing for hair care. Looks full of herbs and natural ingredients. I will try to use Shiny locks Shampoo. these sound divine! going to have to see if I can find them in Dubai, my hair could use a whole lot of love right now. I would love to have this product. I like when my hair is left soft and silky without me being left with a dry scalp. This is the first time I've heard about Elemental Herbology! They would definitely look stylish in my bathroom, love the packaging. I like the fact they contain jojoba oil and shea butter, as well and rosemary since those ingredients work amazing with my hair! Hello! This is a great post that you've share to us. I would love to have this product soon. Thanks for sharing this review, never heard of this brand, but wanna try it out! Hair Souffle makes it sound edible. LOL. I love that it has Jojoba oil and Shea. Two of my fave things!